Game Theory involves the study and construction of models of different decision nodes and the outputs resulting from them. The players involved, which may include individuals, corporates or any other organizations, have different options to choose from and do so based on the payoffs they expect from it. The current state of Fintech startups presents itself as a very interesting game, the decisions of which will impact the growth and future of this upcoming space. The players of the game include a Fintech startup & an Incumbent (like a Bank). 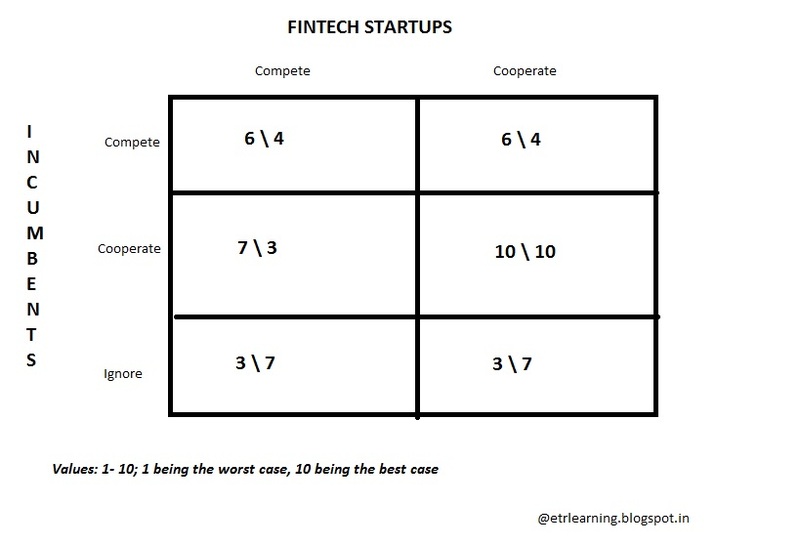 Fintech startup – can either Compete or Cooperate with incumbents. Incumbent – can either Compete, Cooperate or Ignore. If the Incumbent & the Startup Compete – the startup has certain advantages in terms of focus, agility and cost and can gain a good market share in the particular focus area. However, the incumbent, owing to its size and customer base, will have an advantage. If the Incumbent Competes & the Startup Cooperates – again, the result will be as above as the incumbent holds advantages of scale and existing customer base. If the Incumbent Cooperates & the Startup Competes – a startup wanting to compete with an incumbent looking to cooperate will prove detrimental for the startup. Startups will find it very difficult to match the advantages an incumbent has owing to scale and the data it owns. Also an incumbent can easily find another startup looking to cooperate. If the Incumbent & Startup Cooperate – this seems like the best case scenario for both as the synergies between the cost advantages of a startup and the scale advantages of an incumbent can result in significant value creation. If the Incumbent Ignores & the Startup Competes – the startup will gain advantages as the incumbent is not willing to react to the former’s progress and is losing out business in that area of its business. If the Incumbent Ignores & the Startup Cooperates – since the incumbent has chosen to ignore the startup’s actions, the payoff remains as above. Looking at the Startup’s payoffs, it should always choose to Cooperate as the payoffs are higher for it in either of the options selected by the incumbent. The same holds for the Incumbent as well. Hence, Cooperate-Cooperate is where the equilibrium lies. I was looking at your game theory model. 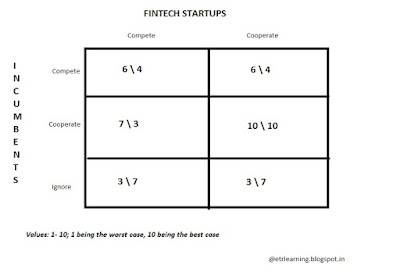 What is the basis of the numerics that you inputted into the model for Fintech Start ups and Incumbents?